If you have ever watched 'Mythbusters' on the Discovery Channel, you would know myths are quite often blown to smithereens on the show. Sometimes literally too. 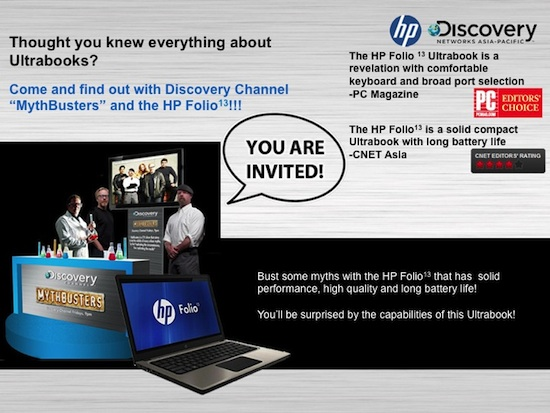 And so, in collaboration with Discovery Channel, HP will be bringing you the ultimate 'Mythbusting' experience through a special roadshow at Marina Square, Central Atrium, on 14 to 15 April 2012. Expect an enthralling and interactive time, as you step into the shoes of a 'Mythbuster' and challenge pre-conceived notions about Ultrabooks. Get up close, touch and feel HP's business ultrabook – HP Folio13 – as you test the 'myths' surrounding the features associated with laptops, and discover the unique features of the new HP Folio13 in a whole new way - challenge the product’s outstanding battery life, thin and light design and CoolSense technology. And if you need an ultra-good reason to head down to the roadshow this weekend, here's one. Stand a chance to win a spanking new HP Folio13 Laptop! 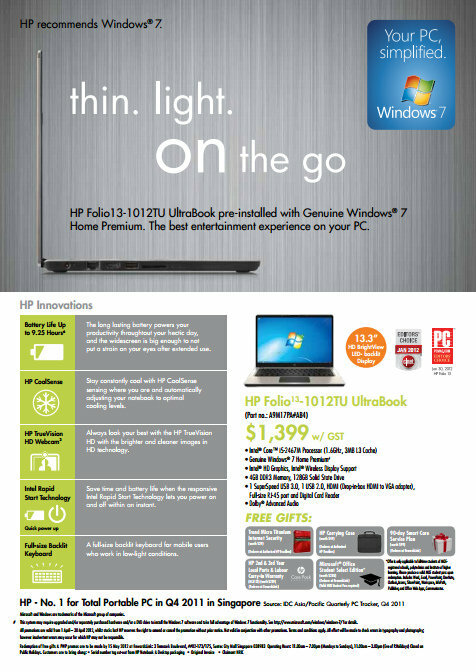 So remember, POSE & SNAP a photo with the HP Folio13 this Saturday and Sunday 14th and 15th April 2012 at the Marina Square (Central Atrium) Roadshow and TWEET it in the above format for a chance to win a new laptop! Good luck!